Hello and welcome to Setlzer’s Lebanon Bologna. My name is Jason and I’m going to take you through a little tour of Seltzer’s and what we do here. Seltzer’s Lebanon Bologna began in 1902 when Harvey Seltzer founded the company and started making a version of German bologna here in the Lebanon Valley. 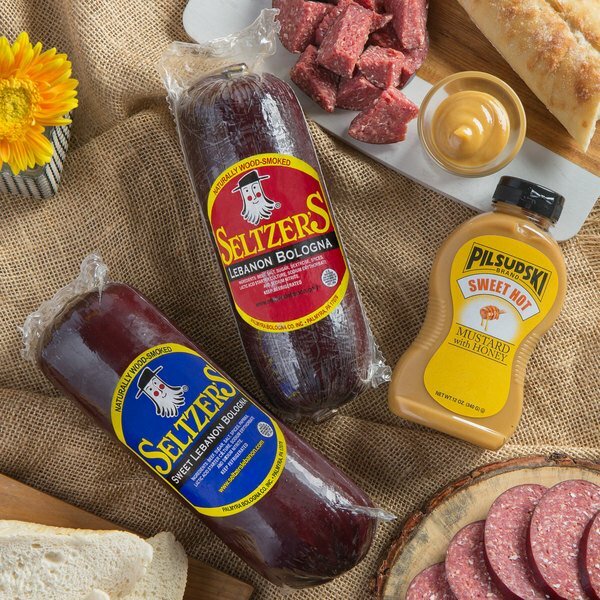 Seltzer’s Lebanon bologna is a craft, smoked deli meat product. Seltzer’s is always made from all beef. Our beef is 87-90% lean and we never use any pork, poultry, or fillers. We simply grind that beef and we add some spices, some sugar, some salt and a couple of curing agents and we grind that all together, it comes to about the texture of a hamburger. We put that mixture into a food grade casing. We put that casing into a stalking net and then we hang that stocking net in one of our outdoor wooden smokehouses where it smokes for 2 1/2 to 3 days. Let me introduce you to our smoke master Denny Kettering. These are outdoor wooden smokehouses, which the bologna goes into the houses. Somebody is here twenty four hours a day attending the fires. There’s a 4 1/2 foot deep pit down there, that’s where the fire is. Then there is a thick steel plate over the pit and a sprinkler system, which keeps moisture in the house. We are one of the very few who still does it in the wooden smokehouses. We use any kind of hardwood that’s available; it’s all from local lumber companies. Now that you’ve seen the difference, please come taste the difference. Based in the rolling hills of Pennsylvania Dutch country, Seltzer's Lebanon Bologna is the leading producer of the regional bologna specialty. Seltzer's Lebanon Bologna pride themselves in being one of the oldest USDA-inspected operations in America. When will my refrigerated or frozen food product be shipped? In order to control the amount of time in transit for these perishable items, they are only shipped on select days of the week based on which shipping method you choose. Ground: Orders ship Monday through Wednesday with most orders placed before 2 p.m. EST on Wednesdays being fulfilled that same day. Second Day: Orders ship Monday through Wednesday. Orders placed before 2 p.m. EST on Wednesdays will ship the same day. Next Day: Orders ship Monday through Thursday. Orders placed before 2 p.m. EST on Thursday will ship the same day. Orders placed after the cutoff will ship the following Monday. I used to buy from Seltzer’s website and shipping was cheaper. Why does shipping cost more now than it did before? These “keep refrigerated” products are shipped in Styrofoam coolers with dry ice and/or ice packs to ensure the products are safe to consume. Previously, these products were shipped without insulation or ice, which greatly reduced the shipping cost, but increased the risk of product safety and quality. To help compensate the higher cost associated with refrigerated shipping, product prices are now lower than they originally were on Seltzer’s website. Previously known as holiday box #4, this holiday dipper pack includes a variety of delicious bologna made with quality ingredients like premium beef and spices. These products are expertly cured and feature an authentic smoke flavor that your guests will love. A perfect and professional gift, you can trust that these bolognas from Seltzer's are a product guaranteed to please. This pack offers the best of both worlds with sweet and original Lebanon bologna. It includes 4 lb. whole original Lebanon bologna and 4 lb. whole sweet Lebanon bologna. This style of bologna is great for slicing for sandwiches or cubing for a tasty snack. 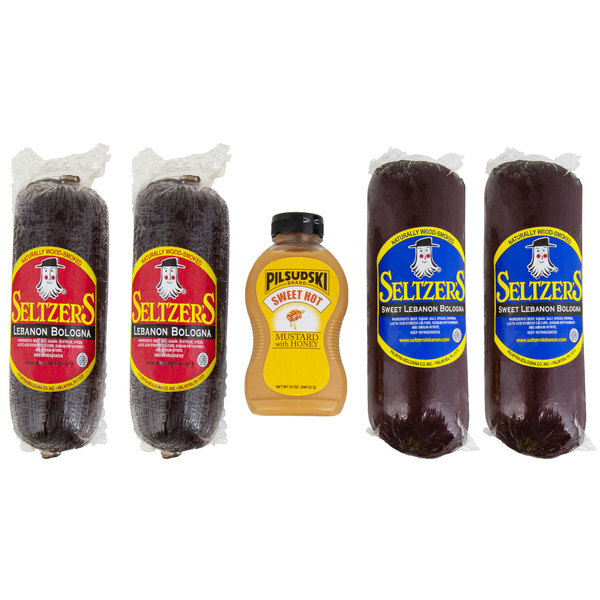 It also includes a bottle of sweet hot mustard for dipping or spreading on sandwiches! Show your appreciation for your favorite customer, most important vendor, business partner, or anyone else. Great for any occasion, use this holiday pack to give the gift of Seltzer's flavor and quality! Based in the rolling hills of Pennsylvania Dutch country, Seltzer's Lebanon Bologna is the leading producer of the regional bologna specialty. One of the secrets to their success is their old-fashioned process of smoking their bologna over hand-tended fires. 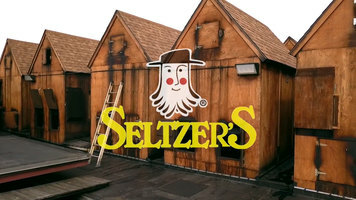 Quality control over both the ingredients and the smoking process is a priority at Seltzer's Lebanon Bologna, and they pride themselves in being one of the oldest USDA-inspected operations in the country. Bring the tradition of Seltzer's Lebanon Bologna to your business to add a classic, delicious product your customers are sure to love. This item is shipped refrigerated. You will need to ensure this item is stored at 41 degrees Fahrenheit or cooler. This item is Gluten Free per the manufacturer.